I ducked involuntarily as a big “something” buzzed my head as I was weeding in the Tomato Patch. An inquisitive hummingbird? A wren parent distracting me from a nearby fledgling? A pterodactyl? No, it was just a killer—a large wasp known as the cicada killer. 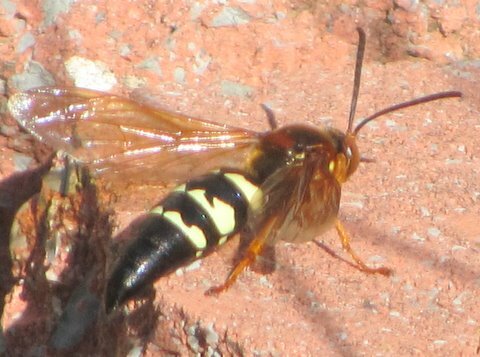 Perhaps you’ve seen them—black-and-yellow wasps (Sphecius speciosus) that zoom with jet-like speed and dig nickel-size holes in the ground. They’re of a size—an inch and a half long–that causes insect haters to panic when one flashes by or rearranges hair on the top of your head as it hovers an inch above. They’re common throughout North America and often live on forest edges and city parks—plus in the Tomato Patch and flower gardens here at Meadow Glenn. National Audubon Society Field Guide to Insects & Spiders (North America) indicates adults feed on nectar and larvae feed on cicadas, though from reactions I’ve observed when a killer buzzes a visitor, they may as well be vampires looking for a soft neck. The male killers stake out breeding areas, sometimes called leks, from perches on plants, bricks, or stones, sort of like fighter jets sitting at the ready on an aircraft carrier. I’ve walked by them and been “buzzed” hundreds of times, but never stung. The reason is simple: The aggressive male guards don’t have stingers. Please don’t tell my friends that because they think I’m super brave as I nonchalantly walk by as the killers zip and zoom around me. For two weeks now the male killers have been doing aerial combat as they stake out territories in and around our gardens and sidewalks. I’ve already found two tunnel entrances in our Tomato Patch. 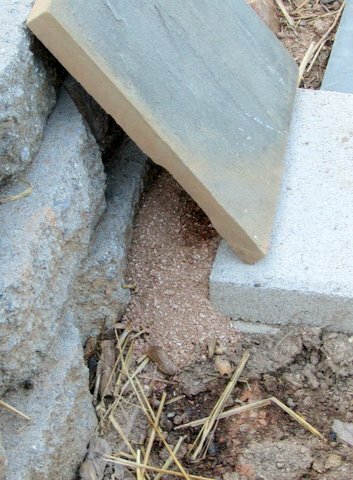 One was behind a piece of slate that I had leaned against a terrace wall, and the other was angled through straw mulch and into the side of a hill I’d built up around plants. I’ve found five or six more entrances in other gardens—under lamb’s ear leaves, blanket flowers, blue star junipers, moss phlox, the watering hose, and sidewalks. I’m a live-and-let-live sort of a guy, so I accept the presence of the cicada killers—except those in areas where they terrorize visitors or where I work daily and am in danger of seriously offending them. 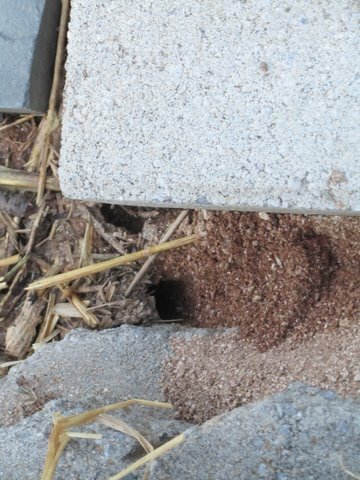 I’ve “puffed” some Sevin into the entrances of the tunnels in the Tomato Garden and several along our sidewalks. 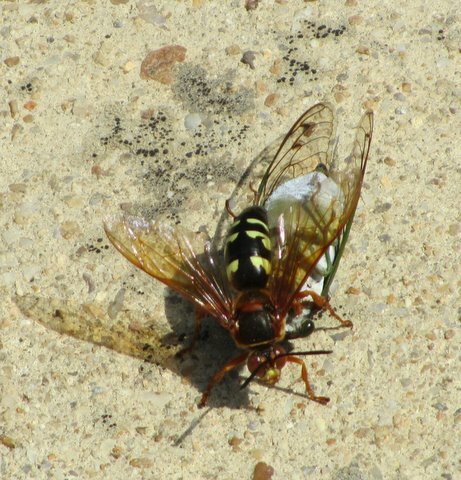 When I was weeding in one of our veggie patches yesterday (Sunday), a female cicada killer landed about four feet from me with a paralyzed cicada under her. She became confused because, I suspect, I had just hoed shut the entrance to her tunnel. Then like a mighty helicopter lifting a huge truck, she flew the cicada to what she thought was the trunk of a nearby tree—apparently so she could look over the situation, locate her tunnel entrance, and let gravity help her fly her baby food into her nesting chamber. The tree trunk, however, was the black leg of my denim work pants, and she started to drag the cicada up my left pants leg. When she got to my knee, I shook my pants leg and she fell off, dropping the paralyzed cicada. She flew around the cicada, grabbed it again, and tried to fly it to the “tree trunk” again. I backed away before she landed, and she crashed with her load on the sidewalk. I snapped a photo and she dragged her prize toward my shoe for the third time. I retreated and she turned course and dragged the huge bug up a nearby retaining wall and disappeared into a bed of lilies. I am not surprised to report that I am alive and well. Though they can sting, female cicada killers seldom are aggressive, and this one was clearly preoccupied with carrying the paralyzed cicada to her nesting cell. I never felt in danger. In fact, after the encounter, I felt just a bit sad that I may have seriously disrupted her reproduction cycle. ← Why did I plant so much? thanks for the info – what an interesting post!